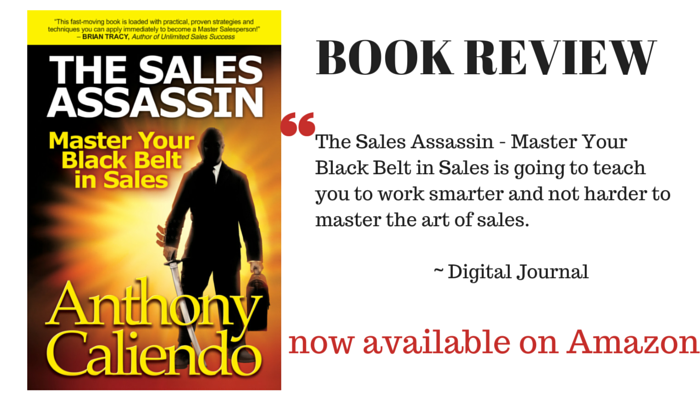 Caliendo, an inspirational and highly accomplished author, speaker, entrepreneur and leadership coach offers his secret to sales success in his book: The Sales Assassin – Master Your Black Belt in Sales. The book helps the struggling sales professional evolve from an uncertain beginner to a consummate sales master. It is also geared to push the average person in sales from mediocrity to greatness. The initiated can either become an individual master through the process in the book or use its methodology to become a better salesperson at their place of employment. Business owners and entrepreneurs can also take away best practices and tools from The Sales Assassin to optimize their abilities to sell their brand name, products and services. The book also supplies information and the motivation needed to build your sales skills and confidence that is often needed in this difficult profession. The message within it teaches you to pick yourself up and dust yourself off when you encounter the daunting circumstances, failures and closed doors that anyone in the field is bound to encounter. Caliendo teaches this sales mastery through 9 Black Belt sales strategies that are modeled similar to those found in martial arts disciplines. The strategies are well-formulated and effective, and the book is easy to read, The Sales Assassin doesn’t have any “fluff” or extraneous material that isn’t important to the core message of transforming yourself into a marketing machine, either. One of the strongest messages in the book is how Caliendo challenges the reader to change their accepted philosophy and mindset associated with the traditional sales approach. The outdated practice of trying to sell more than you did last year or a work ethic that advocates basic concepts such as arriving to work early and being the last to leave have no place in this new world of sales described in The Sales Assassin. The approach Caliendo uses basically transcends this approach. The author tells us the top producers of sales performance are those that will produce with or without the tools, training and resources of the biggest organization. This person has the SAM DNA-a Distinctive Nature to Achieve, Caliendo tells us. So if you have SAM DNA , then The Sales Assassin – Master Your Black Belt in Sales is going to teach you to work smarter and not harder to master the art of sales.